David Oberkircher and Upper. Photo © Sportfot. Wellington, FL – February 17, 2019 – The sixth week of the 2019 Winter Equestrian Festival (WEF) concluded on Sunday, February 17, with jumper competition on the grass derby field at Equestrian Village at the Palm Beach International Equestrian Center (PBIEC) in Wellington, FL. David Oberkircher (USA) and Upper, owned by Southfields Farm LLC, rose to the top of the $25,000 Hermès Under 25 Grand Prix. Riding out on the beautiful grass derby field in the morning, some of the best up-and-coming show jumpers in the world competed for top grand prix honors. There were 43 entries in the class, with 13 of those going clear to advance to the jump-off. Taking advantage of an opportunity to show on the grass derby field at Equestrian Village, the individual silver medalist at the FEI World Equestrian Games™ Tryon 2018 was able to speed to the lead of the class. Martin Fuchs (SUI) rode Jacques Bodenmuller’s Cristo to a blazing time of 33.733 seconds to win the $25,000 CP Grand Prix, the closing event of WEF 6. Twenty-four entries went to task on the first round, and five went clear to contest the jump-off. Fuchs went first on Cristo, setting an unbeatable time. Coming closest was Caelinn Leahy (IRL) on Steve Schaefer’s Dymendy. They finished in 36.206 seconds. Third place went to Hector Florentino (DOM) riding Venus, owned by Raylyn Farms Inc., in 37.330 seconds. The final day of WCHR Hunter Week at the 2019 Winter Equestrian Festival came to a close on Sunday, February 17, with top junior and amateur hunter riders returning for one final day of special competition. Well-braided horses and riders in shadbellies once again took to the International Arena at the Palm Beach International Equestrian Center as the day kicked off with the $5,000 Peggy Cone Memorial WCHR Adult Hunter Classic. As one of the largest classes of Hunter Week, the classic saw more than 70 top hunter combinations contest for a chance to make the top-12 callback for the second round of competition. Coco Fath of Fairfield, CT and Akinda were late in the order of go for the first round, but rocketed right to the top of the leaderboard with a top score of 89.00 points for their effort. While 11 of the class’s best-scoring riders returned before Fath to contest the second course, none could overcome Fath and the Hillside Farm LLC’s 13-year-old Warmblood mare. The team’s second round score of 81.00 points gave them a combined total of 170.00 points which was 2.5 points higher than second place winner Ava Lindsay and Fabricio 23. Martin Fuchs and Clooney 51. Photo © Sportfot. Twenty-seven combinations headed to the South Ring at the Palm Beach International Equestrian Center on Saturday for the THIS National Children’s Medal 15-17. The medal is one of many top equitation classes offered for junior riders throughout the 12-week circuit at the 2019 Winter Equestrian Festival. Alannah Argyle of Dover, MA captured the win aboard the 13-year-old Warmblood gelding, Norway. Wellington, FL (January 29, 2019) – Over two days of competition that were as different as the show jumpers are from the hunters, the fourth week of the Turf Tour and second January Hunter Derby Days wrapped up with young Olympian Martin Fuchs as the $15,000 1.40m Grand Prix victor, Jennifer Madden as the top rider in the $15,000 USHJA International Hunter Derby, and Kim Barone as the winner of the $5,000 USHJA National Hunter Derby. In a 180-degree shift from Friday’s brisk sunshine, a passing cold front brought a steady rainfall for most of the day Saturday. The Ridge’s Hunter Derby Day competitors were undeterred, however, as the covered arena at Jim Brandon Equestrian Center provided for perfect footing and a drizzle free setting for the $5,000 USHJA National and $15,000 USHJA International Hunter Derbies. Jennifer Madden and Margethe Munkdale’s Sirocco set the tone for the day, jumping to second in the Classic and first in the Handy round to win the $15,000 USHJA International Hunter Derby. “Sirocco is a relatively new Derby horse but he has won just about every class we’ve entered,” said Madden. “He’s very personable and tries his hardest every time. Having the covered was a huge blessing as the rain just hasn’t stopped, and while we’ve only been to The Ridge’s events a few times we are sure to come back.” Madden’s victory in the class of 15 was made even more impressive by the stiff competition from her fellow international riders and their mounts, which included first 2019 International Hunter Derby winner at the Ridge, Olympian Peter Wylde and Michelle Kamine’s Dynamo. Swiss spectators were treated to a superb moment of top sport when homegrown hero, Martin Fuchs (26), stormed to victory at the tenth leg of the Longines FEI Jumping World Cup™ 2018/2019 Western European League at Basel (SUI). This was the tenth anniversary of the fixture staged in the medieval Swiss town, but the first time for the venue at St Jakobshalle to host a leg of the Jumping World Cup series. The young man who scooped individual silver at last year’s FEI World Equestrian Games™ made it all the more memorable when steering his faithful grey gelding Clooney to a last-to-go win in a nail-biting three-horse jump-off against the clock. The Netherlands’ Marc Houtzager (48) had to settle for runner-up spot with Sterrehof’s Calimero while Belgium’s Pieter Devos (32) and Apart slotted into third on a day when a first-round clear proved very difficult to achieve. The opening course designed by Germany’s Frank Rothenberger was no walk-in-the-park, with testing turns, difficult stride distances, and a tight time-allowed of 68 seconds ensuring that only those horse-and-rider partnerships that were completely in sync would leave all the timber intact. A total of 21 had given it their best before Houtzager put the first clear on the board and, as so often happens, that was followed by another from Devos who was next to go. Two horses later Fuchs would add his name to the very short list of successful contenders to make the cut into the second-round race against the clock. Houtzager was first to take on the jump-off track and set the target with a great clear in 38.84 seconds, but Devos upped the pace considerably when next to go with his Stuttgart winner, Apart. However, the influential double at fence 11 was still in place and when the pair lost impulsion after a tight turn on the approach the first element fell for four faults in the very quick time of 36.98 seconds. So as Fuchs entered the arena the result was still wide open and the crowd was buzzing in anticipation. Clooney was crowned Swiss Horse of the Year this week and hopes were high that the dynamic duo whose stellar career already includes ninth place individually at the Rio 2016 Olympic Games, a fourth-place finish at the Longines FEI Jumping World Cup™ Final in Omaha (USA) in 2017 and that individual silver at last year’s World Championships would steal the last-minute limelight. It was some pressure, but they didn’t disappoint, the gallant 13-year-old grey responding with all the willingness in the world as his rider asked him to lengthen his stride between the two oxers at the midway stage, putting in a supreme effort to clear the tricky double three from home and then turning super-tight to the penultimate red vertical. Fuchs kept his eye on the finishing line as they cleared the final fence, and when he turned to check the time, he threw his hat in the air in celebration as 37.61 seconds left him the clear winner. The crowd went wild. “He was a bit fresh and spooky in the first round and the short time-allowed didn’t make it any easier – I was just inside time which was a bit lucky!” he said afterwards. But he did have a plan. “I saw the riders going before me and I discussed what to do with Steve (Guerdat) and my dad (Thomas Fuchs),” said the man who also topped the fourth leg of the Western European series in Lyon (FRA) in November. He has now moved back up to third on the Western European League which continues to be led by his fellow-countryman and World No. 1 rider Steve Guerdat, while Devos is in second place. With 55 points on the board Fuchs is well qualified for the Longines 2019 Final in Gothenburg, Sweden in April and is now heading off to compete in Florida, USA for the next few weeks and is taking Clooney with him. Basel’s entry to the Western European League circuit got the thumbs up from FEI Jumping Director John Roche. “The event has been organised to the highest standard; there was a completely full house today and the atmosphere was electric. A home win went to the last man into the arena, so you couldn’t have written a better script for a fantastic day of sport!” he said. The League now moves on to Leipzig, Germany next weekend. Switzerland’s Martin Fuchs (26) and Clooney produced a spectacular victory as the fourth leg of the Longines FEI Jumping World Cup™ 2018/2019 Western European League more than lived up to expectations at Equita Longines in Lyon, France. In an edge-of-the-seat 10-horse jump-off that included four riders flying the host-country flag, it came down to a race to catch the target-time set by Italy’s Lorenzo de Luca and Ensor de Litrange, who were fifth to go. And the last three chasing down that time were Rio 2016 Olympic team gold medallist Kevin Staut from France and the silver and bronze medallists from this year’s FEI World Equestrian Games™, Fuchs and fellow-countryman Steve Guerdat. With a third-place finish last weekend in Verona, Italy, the Swiss rider now heads the Western European League table carrying a handsome 35 points, so only needs a few more to book his ticket to the Longines Final in Gothenburg, Sweden next April. French course designer, Gregory Bodo, gave them plenty to think about in the first round in which the 75 seconds time-allowed proved highly influential. “With the top riders and horses present, it’s not easy to find the right balance, but the time was perfect and riders had to keep the right tempo from the start to the end to be in time,” he explained. Italy’s de Luca really put it up to the rest of them in the jump-off when stopping the timers in 37.78 seconds with a great run from his powerful 14-year-old gelding and, with just three left to go, Dutchman Maikel van der Vleuten was his nearest rival after posting 38.00 with Dana Blue. The 7,000-seat stadium was packed with French fans who held their collective breath as Staut set off with For Joy van’t Zorgvliet, but despite their best effort the pair didn’t threaten the lead when breaking the beam in 38.32 seconds. Second-last into the ring, however, Fuchs had his foot to the floor all the way, and with a brilliant turn to the vertical three from home and a breathtaking gallop to the last, he stormed through the timers in 37.25 seconds and not even Guerdat and his brilliant mare Bianca could match that. De Luca held on for runner-up spot, while 2012 Olympic champion Guerdat, twice-winner of the Longines FEI Jumping World Cup™ title, had to settle for third when stopping the clock on 37.89. “Clooney had a one-month break after Tryon (FEI World Equestrian Games) and then we came to Verona and Lyon because I really want to qualify for the Final. I’m going to Wellington (USA) in January, so I wanted to focus on the World Cup qualifiers now,” Fuchs explained. He’s had an extraordinary year with the horse he competed at the Rio 2016 Olympic Games and with which he claimed two European team bronze medals, in 2015 and again in 2017. They kicked off 2018 with 5-Star Grand Prix wins at Basel and Zurich (SUI), but Clooney then had to undergo colic surgery in April and that was a worrying time. He bounced back, however, and just a few weeks after claiming World Championship individual silver, the grey horse is continuing to show incredible form. The Swiss rider now plans to compete in the next leg of the series at Stuttgart in Germany in two weeks’ time and at Olympia in London (GBR) in December. Ben Asselin and Makavoy. Photos © Spruce Meadows Media Services. Calgary, AB, Canada – September 6, 2013 – Speed and power described the two competitions on the schedule today at the Spruce Meadows ‘Masters’. Opening up the evening was the $205,000 Encana Cup 1.60m, and the fastest in the jump-off was Calgary’s own Ben Asselin on Makavoy. The $75,000 ATCO Electric Six Bar featured four rounds of thrilling jumping as Martin Fuchs (SUI) cleared 1.95m for victory on Conte Della Caccia. The Spruce Meadows ‘Masters’ Tournament hosts the best show jumpers in the world through Sunday, September 8. The highlight events of the week are the $350,000 BMO Nations’ Cup on Saturday and the $1 Million CN International, part of the Rolex Grand Slam of Show Jumping, on Sunday. 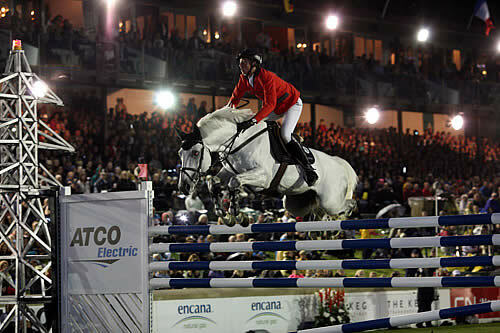 There were 23 entries in the $205,000 Encana Cup, but only three were able to advance to the jump-off in driving rain. First to return was Christian Ahlmann (GER) on Taloubet Z. They had a rail at fence 15, an oxer off a right-hand rollback, for four faults and finished with a time of 46.73 seconds. Francois Mathy (BEL) and Espadon van de Kranenburg also had four faults, but with a slower time of 55.08 seconds. Last in, Asselin and Makavoy were efficient through the turns and as they cleared the final oxer, the crowd burst into cheers when the scoreboard flashed #1. They posted a time of 53.94 seconds for the win. “We originally had [planned] a pretty fast track to try to have a clear round, but when I walked up everyone told me that both riders had four faults. I took a bit of a risk going so slow in the jump-off because if I had a rail down, I probably would have been third, but Makavoy was just unbelievable. He didn’t want to touch any rails,” Asselin explained. Staying cool as the last in the ring was something Asselin had to accomplish. “I really had to work on keeping myself cool around the entire track. Even coming down to number one, my heart was racing. Coming down to the last fence I really had to stay cool. When I landed from that last fence all those emotions just let go,” he revealed. As the only rider to clear 1.95m, 21-year-old Martin Fuchs of Switzerland took the victory in the $75,000 ATCO Electric Six Bar competition with Conte Della Caccia. It was his second Six Bar win in 2013; he has shown three horses in four Six Bar competitions this year. “It’s cool; I like it a lot,” he smiled. Joining Fuchs in the fourth and final round, but unable to clear the fences remaining, were Eugenie Angot (FRA) and Pirate Adalou, Lars Nieberg (GER) and Galippo 5, and Shane Breen (IRL) with Touch of Chilli. They tied for second place. Fuchs has ridden Conte Della Caccia, a 10-year-old Holsteiner stallion by Canturo x Corrado I, for a year and a half, and they have moved up to the 1.60m level. Fuchs will compete for Switzerland in tomorrow’s BMO Nations’ Cup and Sunday’s $1 Million CN International. The Spruce Meadows ‘Masters’ continues tomorrow with the $125,000 Suncor Winning Round 1.50m and the $350,000 BMO Nations’ Cup. For full results and more information, please visit www.sprucemeadows.com.